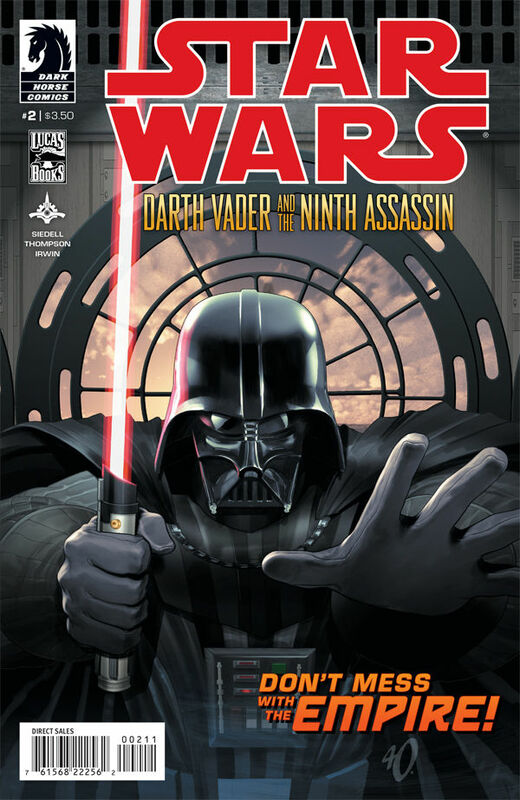 The Fellowship was fortunate enough to obtain a copy of STAR WARS: DARTH VADER AND THE NINTH ASSASSIN #2 from Dark Horse Comics. The story is by Tim Siedell, with pencils by Stephen Thompson, inks by Mark Irwin, colors by Michael Atiyeh, and lettering by Michael Heisler. An Imperial Destroyer takes aboard an escape pod which contains two things… a homing beacon and a suicide bomber! Meanwhile on Coruscant, Lord Vader foils an attempt on the Emperor. Neither one understands why they didn’t sense the attack coming, but the Emperor feels the threat is from a more dark and powerful source. Vader departs to find out who is responsible for these attacks and nearly avoids another suicide bomber. Both bombers wear a strange tattoo which the Emperor remembers being a symbol for an ancient cult that dealt with dark magic. Are the Sith Lords prepared for what the will face? This is a real intriguing story we have here. With so many stories based on the STAR WARS lore, it has to be difficult to find something new to tell. Siedell has found a new story and is telling it very well. The artwork by Thompson and Irwin is top notch. I think any fan of the saga would find this miniseries enjoyable. STAR WARS: DARTH VADER AND THE NINTH ASSASSIN #2 is stores now or available for ordering at www.Darkhorse.com.